My first serious pair of headphones were from Sennheiser, but they were bought so long ago I don't even remember the model number. I loaned them out to a relative and they came back to me broken. I never got around to replacing them and haven't owned a pair since then. 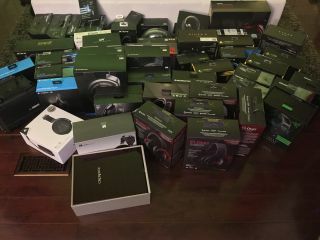 Until I brought in a total of 56 headphones and headsets to test to for months to scientifically find the best gaming headset and the best headphones for serious audiophiles. It sounds mad, but hear me out on why I've done this. It's difficult to sift through the world of audio and find consistent, science-backed reviews. Because audio is subjective, I thought it best to bring everything in on repeatable, predictable measurements and testing methodologies. Reading reviews of headphones is a mostly unreliable endeavor. Almost everyone uses their ears as a measurement system and this can vary wildly from person to person. Our aim: use a sophisticated measurement system designed to analyze nearly every acoustic property of headphones. We'll publish the results of the testing in the near future, and in the meantime this article will explain our methodology, metrics and how to make sense of the data. This all started because of a need to do an article showing how to take desktop PC audio to near or at professional heights. Thanks a bunch to Oppo and Yamaha for supporting that feature. Then came CES. I was at the Creative Labs booth at CES with Wes, auditioning all the new audio gear the company was showing—including its new wallet-busting $5000 speaker system—and Creative asked me if I was interested in hearing some amazing headphones. I said sure. Creative walked me over to a booth called MrSpeakers and introduced to Dan Clark. At the booth were several SoundBlaster X7 units on demo with headphones that seemed larger than what I was use to seeing. Dan explained to me that these headphones were not traditional dynamic driver headphones but planar magnetic, which is a totally different technology. Thinking not much of it at that time, I put on a pair of MrSpeakers Ether C headphones (C for closed-back) and my headphone world was turned upside down. I'd never heard headphones that sounded so good. Then it dawned on me: I needed to get in all the headphones and gaming headsets I could possibly get my hands on, and test them. It would be on an epic scale. I've brought in every gaming headset I could think of in the past one month. Everyone is included (in no particular order): Logitech, Razer, SteelSeries, Roccat, TurtleBeach, Corsair, Kingston HyperX, Mionix, Creative Labs, Astro, Patriot, and Sennheiser. Included in the lot are also high-end headphones from brands you may not have heard of: Fostex, HiFiMAN, MrSpeakers, Oppo, Audeze, and STAX. If you find a brand missing, that's because they haven't responded to my request (yet). Rest assured, more will come. At first it may seem utterly unfair to compare gaming headsets to high-end headphones given the price differences, but there are plenty of headphones that are in the same price range as gaming headsets. Some companies may argue that a gaming headset focuses on the frequency range of speech. This is just wrong. It's a fallacy to think that a pair of headphones that sound great with music will sound awful with games. A good gaming headset should be able to reproduce the entire frequency spectrum well. And besides, you can adjust incoming speech volume in pretty much every game that supports it as well as through whatever voice application you're using. We'll also be using a panel of people that have never used headphones or headsets and have no knowledge about either to perform blind listening tests. Over the past weekend I also attended CanJam, which is one of the largest headphone conventions, produced by the fine folks over at Head-Fi.org. At the show, I was able to spend intimate time with headphone manufacturers to better understand what goes into manufacturing and design as well as different technologies. It was definitely an awesome experience, very much like CES or Computex. With this testing, we plan to update and breakdown our headset buyer's guide to be more granular: wireless vs. wired, open vs. closed, and entry level, mid-range, and high-end. But a month with these headphones definitely showed major difference between headsets. Some have truly terrible audio quality, while some have been pleasant surprises. Others will have good audio but terrible microphones. I'm testing everything. On the next pages, you'll see how I'll do it.